GIMP 2.7.4 now has Wacom Support. I have been working towards replacing Photoshop so I can run Linux full time. But Photoshop is not easily replaced, but the the newest version of GIMP, which is 2.7.4 is getting better everyday and now the issue with no Wacom or tablet support has been fixed. 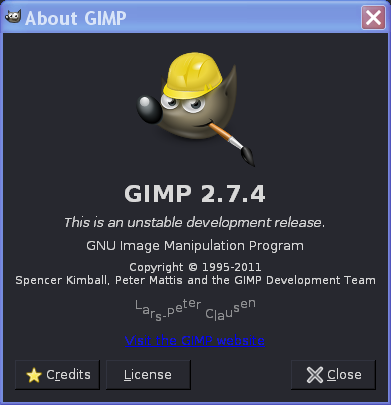 2.7.4 is still an experimental version and is a gimps to what 2.8 will bring. I have been going back and forth working with GIMP's brushes and other features trying to find exceptable workflows for my needs. The normal things that I am able to do in Photoshop. You can find the current build at Partha's Place along with useful plugins. One issue that I noted in the comments section is that you will have to rename "Resynthesizer.exe, Resynthesizer-gui.exe and DBP.exe in the plugins folder by dropping the ".exe" portion for GIMP to utilize those plugins.